The NRCD of ni-msme is actively chasing up with the clusters assigned to it, to put speed in executing the measures suggested by the respective implementing agencies. Also, the Institute is prompting the implementing agencies to manifest fast action. The prominent happenings related to cluster development programme have taken place during the month. 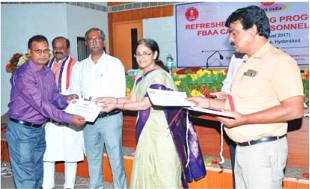 Mr. K. Surya Prakash Goud, Faculty Member, along with Mr. B.M.L. Das, General Manager, JIDCO called at the office of the Development Commissioner (MSME) on 27th Sept 2017 and discussed with Mr. R.K. Rai, Director and Mr. C.S.S. Rao, Deputy Director particularly regarding development of clusters in Jharkhand. Around ten clusters have been selected for interventions. Mr. Rai suggested speeding up the activities concerning the registration of SPV, identification of suitable land for CFC, SPV contribution, etc., after holding detailed discussions. The National Backward Class Financial Development Corporation (NBCFDC) are promoting clusters with the support of the Ministry of Textiles. They have entrusted ni-msme with the preparation of DSR and DPR for theselected clusters. In this connection, Mr. Goud went to Vijayawada along with Mr. Ajit Kumar Punia, General Manager (Projects), NBCFDC on 12th September to hold discussions with Mr. I. SrinivasSrinaresh, IAS, Secretary (Industries & Commerce) to Govt. of Andhra Pradesh and Commissioner for Handlooms and Textiles; and Mr. K. Harshavardhan, Vice-CMD, AP Backward Classes Cooperative Finance Corporation Ltd. regarding scope for the development of handloom clusters in the state. The Secretary desired that ten handloom clusters be taken up in the first phase and advised the Additional Director to take necessary action immediately. Mr. Goud attended the meeting organised by the National ScheduleCasteFinancialDevelopmentCorporation(NSFDC) on 6th September 2017, with the objective of discussing proposals for the development of Handicraft clusters under AHVY. Mr. Goud made a presentation, with the support of NSFDC, on the experience of ni-msme in cluster developmentand methodology is-à-vishandicraft clusters. Mr. Chatragudda Ramesh Rao, DGM; Mr. Ratikanta Jena, AGM; Mr. Devanand, GM; Mr. Rajnish Banker, Manager; and other officials of NSFDC were present in the meeting. They suggested taking up at least 10 clusters at the earliest. In this context, Mr. Goud made a presentation on Adilabad bamboo cluster and Jaggayyapet multi product cluster. The KVIC, Mumbai has assigned ni-msme with the national level evaluation of KVI schemes viz., workshed for khadi artisans, strengthening the infrastructure of existing weak khadi institutions and assistance for marketing infrastructure, AamAdmiBimaYojana, Interest Subsidy Eligibility Certificate, market development assistance, and science and technology scheme. As the first step, the faculty of ni-msme conducted an intensive group discussion under the chairmanship of the Director General to design the sample, sampling method, data collection and analysis, and complete the assignment at the earliest. This was followed by a pilot study, conductedby the faculty in the states of Gujarat, Odisha, Tamil Nadu, Madhya Pradesh, Karnataka, Kerala, Jharkhand, Andhra Pradesh and Telangana. The faculty held detailed discussions with the KVIC officials, representatives of khadiinstituions and khadi artisans on various aspects. Scheme guidelines, selection of beneficiary/institution, implementation and issues in the implementation of khadi schemes, and their impact were discussed at length. A short presentation was made on the outcome before the senior officials of KVIC, Mumbai. Field workhasbeeninitiatedinaccordancewiththeir suggestions. ni-msme, in association with the Khadi & Village Industries Commission (KVIC), Ministry of MSME, Govt. of India, had organised at the Institute campus, a 3-day programme of Refresher Training during 28-30 August 2017, for the audit and accounts personnel of KVIC, working throughout the country. Mr. Vinai Kumar Saxena, Hon’ble Chairman of KVIC inaugurated the programme on 28th August 2017. The chief guest, in his inaugural address, stated that the audit and accounts personnel are the backbone of any organisation and urged them to work with dedication, honesty and integrity in order to fulfill the objectives of the organisation, KVIC. He had shared some of his field experiences and enumerated his specific observations. He got the participants interested in the subject, and advised the officials to manage their time in an effective way and support Khadi Institutions. Mr. G. Chandramouli, Member of KVIC (South Zone); Mrs. Usha Suresh, Financial Advisor (KVIC); Mr. M. Chandrasekhar Reddy, Director General, ni-msme; and Mr. K.S. Rao, Dy. Chief Executive Officer (KVIC); Mr. Babul Mandal, Director (Finance), KVIC were also present during the inaugural ceremony. Mr. M. Chandrasekhar Reddy, Director General of ni-msme, speaking on the occasion, highlighted the activities of ni-msme and its services to KVIC over the past several years. While appreciating suggestions given by the Chairman, the Director General urged the participants to utilise their learnings back in their work-place and implement them for the betterment of Khadi institutions as well as KVIC. During the programme, various important topics relevant to the latest initiatives of the government in the areas of public finance management system (PFMS), transfer of benefit to target groups/beneficiary through DBT, migration to accrual system of accounting, implementation of integrated funds management system (IFMS) through SAP, procurement policy and norms as per GFR 2017, GST, etc., were discussed at length. During the concluding ceremony, Mr. B.H.Anil Kumar, IAS, Joint Secretary (ARI), Ministry of MSME and Mrs. Usha Suresh, Financial Advisor (KVIC) had explicative discussions with the participants and shared their experiences. The participants expressed their satisfaction with the inputs given during the training and thanked the management for arranging such useful training. Mrs. Usha Suresh enquired about the issues at field level and gave suitable suggestions. Mr. Anil Kumar congratulated all the participants for their active participation, advised them to rejuvenate and deliver good results. Later he distributed programme completion certificates. The programme concluded with vote of thanks proposed by Mr. Babul Mandal, Director (Finance), KVIC. A meeting was held with the office bearers of the Vegetable Hand Block Kalamkari Printers Welfare Association, Pedana to discuss agreements, mobilising contribution, issuing tenders for civil construction and machinery procurement. ni-msme will provide support until the CDE is recruited. The society was advised to collaborate with the Weavers Society regarding machinery specifications and building technicalities, which will be done after visits to Salem and Ahmedabad. The society will deposit Rs. 10 lakh towards first installment, and will upload the list of artisans. Further the IA was advised to recruit a CDE and implement social security schemes. The Coir Board has conducted a meeting of coir clusters on 15th March 2017 at Vengurla to review the implementation of soft and hard interventions in the Sawantwadi and Pendur coir clusters, and discuss about the construction of common facility centre and procurement of machinery. The representatives of the implementing agencies, SPVs and CDEs attended the meeting. Initially, Mr. Todkar, officer-incharge, Coir Board welcomed all the members and explained about the status of the clusters. The CDEs presented the status of progress of works and action plan for interventions. Guidance was given to CDEs/SPVs/IAs regarding obtaining the approval of the gram panchayat, preparation of estimations for civil works, organising exposure visits and design development workshops. Later, in the purchase committee meeting organised for both clusters, which Mr. M.K. Gawde Prabhodini, President of the implementing agency of the Pendur coir cluster, and Mr. K. Surya Prakash Goud, FM, ni-msme attended, Mr. Goud gave inputs for successful implementation of the project. Mr. K. Surya Prakash Goud, Faculty Member, ni-msme, along with Mr. L. Vijaya Kumar, consultant and Mr. H.K. Chary, National Advisor, IL&FS; Cluster Development Initiatives Ltd. visited the Pembarthy metalware cluster on 18th March 2017 to review the progress of soft and hard interventions. They organised a review meeting with key stakeholders including SPV members and artisans. The discussions focused on inviting tenders for civil works and procurement of machinery and implementation of soft interventions. Mr. Chary and Mr. Goud gave suggestions for smooth and speedy implementation of the project. The purchase committee meeting of coir clusters was held at Vengurla on 25th March 2017 to discuss and finalise machinery suppliers. After Mr. Goud and Mr. Todkar together reviewed the clusters, the members visited the sites where Common Facility Centre is to be established, along with machinery suppliers. The SPVs were given suggestions on layout of machinery as per the process flow, and basic amenities to be provided for the workers. Coir Board has organised a review meeting with technical agencies on 27th March 2017, chaired by Mr. M. Kumara Raja, Secretary, Coir Board, in which TA representatives from ni-msme, EDII, and Foundation for MSME clusters participated to discuss issues concerning implementation of the project. Mr. Ajit Kumar, Director (Marketing and Accounts) and other officials were present in the meeting. The Secretary discussed issues critical to project implementation. Earlier, Mr. Goud apprised the SFURTI officials about recently completed activities in Maharashtra and Andhra Pradesh clusters. The SPV members of Tirur integrated coconut processing cluster discussed with the Secretary (Coir Board) regarding convergence initiatives. The Secretary gave useful suggestions on achieving convergence. The one week training programme conducted during 22-26 May 2017, attracted a total of 12 participants from Bhatinda Honey Processing Cluster; Tirur Coconut Processing Cluster; Kondapally Wooden Toys Cluster; Pedana Kalamkari Cluster; and representatives of Grant Thornton, Noida; Telangana State Industrial Infrastructure Corporation, Hyderabad; and Vinoba Sewa Ashram, Pilibhit Mr. K. Surya Prakash Goud, programme director, outlined the programme objectives and inputs to be given during the programme. Mr. Vivek Kumar AFM, SED; Mr. L. Vijay Kumar and Mr. G. Rajkumar of ni-msme were also present on the occasion. The main topics of the programme included cluster concepts and methodology, role and responsibilities of CDE,diagnostic study and DPR, management of CFC, role of IA,TA, CDE and SPV, cluster governance, scope for e-marketing, export procedure, BDS deployment etc. Apart from classroom inputs, the participants were also facilitated with visit to Pochampally Handloom Park to give practical exposure of concepts. Experts were invited to address the sessions and share experiences. Mr. Bhoomaiah, State Director, KVIC, Andhra Pradesh; Mr. H.K. Chary of IL & FS Clusters Ltd.; Mr. A.S.K. Sharma of the Foundation for MSME Clusters; Mr. Koteswar Rao of Global EXIM Institute were the experts. The participants also shared their cluster experiences with one another. During the valedictory Mr. M. Chandrasekhar Reddy, Director General interacted with the participants and shared his cluster development experiences with them. The Project Steering Committee (PSC) of the Khadi & Village Industries Commission (KVIC) was held on 11th May 2017 in Mumbai. Mr. Surya Prakash Goud, Faculty Member, ni-msme attended on behalf of ni-msme and presented the DSR of Jonnada Food Processing Cluster along with Mr. Raja Babu, President, M/s Society for Rural Self-Development and Rehabilitation, the proposed implementing agency, Kadiyam Mandal, Andhra Pradesh. The committee members enquired about the SPV contribution, land availability, scope for product diversification and marketing strategy. They suggested including different food products to increase the product range so that the artisans will have economic activity throughout the year. Mr. K. Surya Prakash Goud, Faculty of ni-msme, visited the MothkurIkat Handloom Cluster on 28th May 2017 along with Mrs. Sharmista Mahapatra and Mr. H.K. Chary of IL & FS Clusters Ltd. and visited and interacted with the weavers and other members who are participating in the skill development programme. They interacted with the trainees and Mr. Ch. Parameswar, CDE about the programme inputs, profile of the faculty, etc. Mrs. Sharmista advised the implementing agency to focus on demand driven product designs and help the artisans to improve their skills in dyeing and weaving to achieve better quality and productivity improvement. They also discussed with SPV members regarding the progress of hard interventions. Dr. K.K. Jalan, IAS, Secretary (MSME) to Government of India, visited the Srikalahasti Kalamkari crafts Cluster on 4th June 2017. Mr. M. Chandrasekhar Reddy, Director General, ni-msme; Mr. K. Rajendra, Executive Director, Ministry of MSME; Industrial Promotional Officers Mr. K. Nagarjuna and Mr. K. Hari Krishna joined him in the visit. At the CFC located in Pallamala village the Secretary took stock of the civil works progress and interacted with the artisans. He advised Mrs. G. Munilakshmi, president of the implementing agency apprised him that the construction of CFC will be completed by the 2nd week of August and about 100 artisans of Pallamala and nearby villages will be benefited. Further she explained about the soft interventions viz., SHG training, ToT, training in MS-Office and e-marketing, and exposure visit. 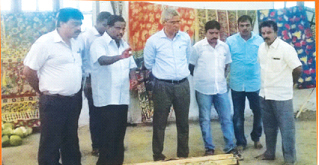 Later, the Secretary visited the kalamkari unit at Srikalahasti. Mrs. Muni lakshmi explained to him in detail about the process of Kalamkari art and preparation of colours. The Secretary enquired about raw materials. Mr. G. Dasaradha Chari, advisor, IA apprised him of the usage of raw materials - gadda cloth, silk, cotta silk, chenderi, jargit and mallu cloth. Regarding marketing avenues for cluster products, Mr. Chari reported that the artisans participate in exhibitions, craft bazaars and melas, and supply to reputed boutiques, and state and central government handicrafts corporations. The artisans expressed happiness with the Secretary’s visit and stated that the visit has inspired and motivated them to improve their business skills. Later, they felicitated the Secretary. The National Backward Classes Finance & Development Corporation (NBCFDC), with the assistance of the Ministry of Textiles, is implementing Cluster Development Programme in handloom and handicraft clusters in various states. NBCFDC has entrusted ni-msme preparation of Detailed Project Reports (DPRs) for five clusters in the states of Kerala, Karnataka, Odisha and Andhra Pradesh. Mr. K. Surya Prakash Goud, Faculty Member, FM (SED) attended the meeting at NBCFDC on 16th June 2017 to discuss the modalities of DPR preparation. Mr. A.K. Punia, General Manager (Projects); Mr. Sanjeev Sharma, Officer (Projects); Ms. Shefali, consultant were present at the meeting. Later, Mr. K. Narayan, MD issued the formal work order for DPR preparation for five clusters. The main objective of NBCFDC is to provide financial assistance to the needy and practising entrepreneurs of the clusters through their channelising agencies. Mr. Vijay Kumar, Consultant, NRCD of ni-msme participated in the working committee meeting of Harihara Khadi cluster on 17th July 2017 at Davangere. Mr. K. Chandra Balu, Asst. Director, KVIC; Mr. K. Basappa, President; and Mr. M.S. Ramesh, Secretary of Harihara Charaka Mattu Gramodyoga Sahakara Sanga Ltd.; spinners Mrs. P. Indramma, Mrs. A.R. Puttamma and Mrs. Proyanka, CDE were present in the meeting. They discussed the impact of various soft interventions, designs created by Sri Sai Creations and progress of construction activities. The members appreciated the efforts of implementing agency in selling Khadi products worth Rs. 28 lakh in the national exhibition conducted by KVIB, Bengaluru. The meeting was concluded with vote of thanks proposed by Secretary Mr. Ramesh. Mr. K. Surya Prakash Goud, Faculty Member, SED of ni-msme visited the Sawantwadi and Pendur coir clusters during 17-18 July 2017 to participate in various activities. On the 17th, Mr. Goud participated in the inaugural function of the training programme on MS Office & Internet Applications organised for the SPV members, artisans and the CDE of Pendur cluster, where he emphasised the need for IT skills and cashless transactions. Later, Mr. P. Todkar, Sub-Regional Officer, Coir Board, Oros, Mr. K. Surya Prakashm Goud, implementing agencies, SPV members and CDEs discussed the decisions taken in the earlier purchase committee meeting, and physical and financial progress of the project. On the 18th, Mr. Goud along with Mr. Todkar participated in the bhoomi puja of CFC building at Kararewadi. The implementing agency, CDE and artisans were present on the occasion. Later, Mr. Goud interacted with the participants of the training programme in Quality and Productivity Improvement organised for the benefit of the artisans. He explained 5S management tools with the help of simple examples. The Govt. of Jharkhand has engaged ni-msme services for implementing cluster development programme. ni-msme will support cluster stakeholders in capacity building and facilitate the establishment of common facility centres. In this regard, Mr. K. Surya Prakash Goud of ni-msme visited Ranchi to meet Mr. K. Ravi Kumar, IAS, Director of Industries, Govt. of Jharkhand and the officials of Jharkhand Infrastructure Development Corporation (JIDCO) during 3-4 July 2017, along with Mr. B.L.N. Das, General Manager (Clusters), and Mr. D.P. Vidhyarthi, General Manager (Infrastructure), JIDCO to discuss arranging exposure visits for SPV members, conducting training in management of CFCs, and providing mentoring services during the implementation of various interventions. JIDCO had organised a workshop on 4th July inviting the officials from select DICs, and SPVs of proposed clusters. Mr. Goud interacted with cluster stakeholders regarding their infrastructural requirements in CFCs, mobilisation of funds, specifications of machinery, business operations, etc. Mr. L. Vijay Kumar visited the NBCFDC office at Bengaluru on the 11th July and discussed with Mr. Ekanatappa, Managing Director regarding transportation of raw material, marketing skills, lack of information on latest machinery and markets, and need for conducting skill development programmes. Mr. Ekanatappa highlighted their schemes for women artisans and children, and SHGs. Further he stated that they provide term loans, service and other loans at less than 2% annual interest which is transferred directly to their account through DBT facility. Mr. G. Raj Kumar visited Palakkad and Trissur for interaction with the officials of Kerala State Backward Classes Development Corporation, Development Commissioner for Handicrafts, IRTC, KVIB and industries department during 11-17 July 2017.He also visited artisan villages to collect the cluster information. Some of the important officials met included Mrs. Latha, Manager, KSBCDC, Palakkad; Mr. Jacob D'Souza, Assistant Director, HM & SE Centre, Thrissur; Mr. Bala krishna, IEO, Chittoor; Mr. Shiva Das, Officer, Khadi & V.I. Board, Palakkad; and Dr. N.K. Shasidaran Pillai, Director, Integrated Rural Technology Centre, Mundur. The artisans were practising aged methods and using the traditional pottery wheel, sometimes even with hands without the wheel. The artisans expressed their problems with respect to procurement of raw materials, usage of outdated technology, lack of infrastructure and marketing, in Large Group Discussions (LGD) and Small Group Discussions (SGD) in which the officials, master craftsmen and artisans had participated. They requested support through installation of machinery for improved quality and productivity, deputing a professional designer to make demand driven products, and conducting skill development programmes.